The Enterprise crew follows Commander Kor and his men through a wormhole, ending up on an alternate Earth in the year 3878 dominated by sentient apes that have enslaved man. There, the Klingons form an alliance with the apes, while Kirk and his men befriend an astronaut named Taylor. 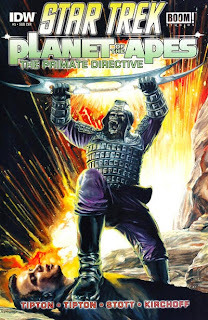 This story establishes the Earth on which the Planet of the Apes films take place as an alternate reality to the CU. 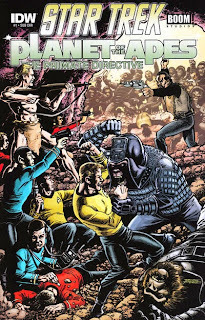 This story is not dated, but it takes place after the Star Trek episodes “Errand of Mercy” and “Mirror, Mirror,” both of which occur in 2264. December 2264 is a gap in Win Scott Eckert’s “The Star Trek Annotated Timeline” (found on the An Expansion of Philip José Farmer’s Wold Newton Universe website.) In the timeline of the Planet of the Apes series, the appearances of Taylor and other characters from those films take place between Planet of the Apes and Beneath the Planet of the Apes. 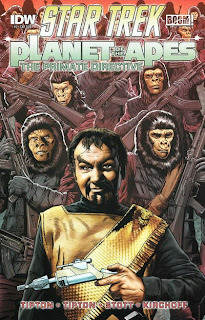 If I remember correctly one of the Tales of the Shadowmen stories had Doctor Omega on the Planet of the Apes from Pierre Boulle's original novel. The one that was not Earth, but actually another planet. I think that would also be an AU. According to The Star Trek: The Next Generation Companion, by Larry Nemecek, when filming the second season TNG episode "The Icarus Factor," there was a "Klingon shortage" due to "the simultaneous shooting of Star Trek V," which resulted in two of the Klingons in this episode having "to wear old Planet of the Apes boots!" 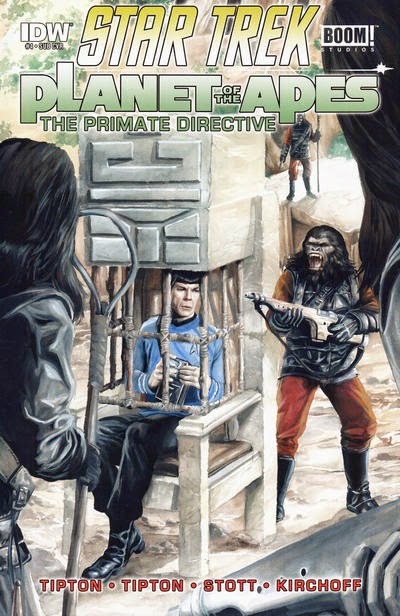 I wonder if the Klingons took some of the Apes' clothing as some sort of war booty when they returned to the CU and continued to wear them even decades later into the TNG era? 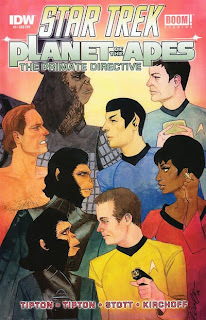 And speaking of Star Trek, check out Christopher Bennet's annotations for his recent novel Uncertain Logic, which states that he includes another reference to The Questor Tapes: https://christopherlbennett.wordpress.com/home-page/star-trek-fiction/rotf-uncertain-logic/rotf-uncertain-logic-annotations/. He also mentions that the TNG novel Immortal Coil referenced TQT, but I don't recall seeing that reference when I read IC. Maybe I just missed it, though. Win also listed Immortal Coil in Vol. 2, and said Flint must have met the original Emil Vaslovik at some point in the 20th century.